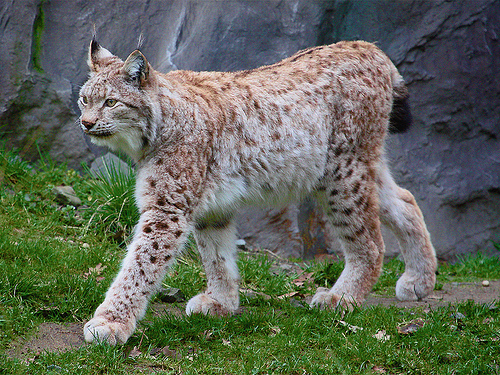 The Eurasian Lynx is a species of medium-sized predatory cats found in East and Central Asia, Siberia, Scandinavia, as well as in parts of Europe. It has a strong muscular body and long, powerful legs, with the characteristic stubby “bobbed” tail having a black rounded end. 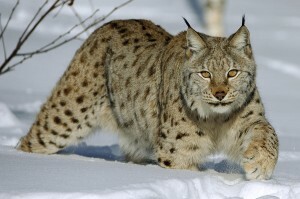 The tips of its large ears have the distinguishing black tufts while its frill of long gray/white cheek hairs gives off an impression of a dense mane. The Eurasian lynxes are solitary creatures that are mainly active after sunset and at dawn though they may choose to kill their prey during the day if food is scarce. These are primarily terrestrial animals with sneaking, stalking, and jumping abilities, which are used for hunting. 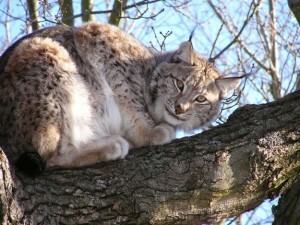 They have excellent vision and hearing and may even climb on to trees or high rocks to examine their surroundings. They are often seen resting under thickets of grasses and trees. These territorial animals hunt over an area of 20 to 450 square kilometers with the males having larger hunting ranges than the females. 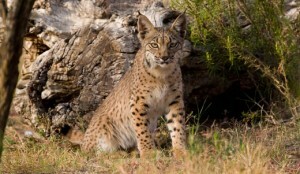 The territories of males can sometimes overlap with that of one or two females. 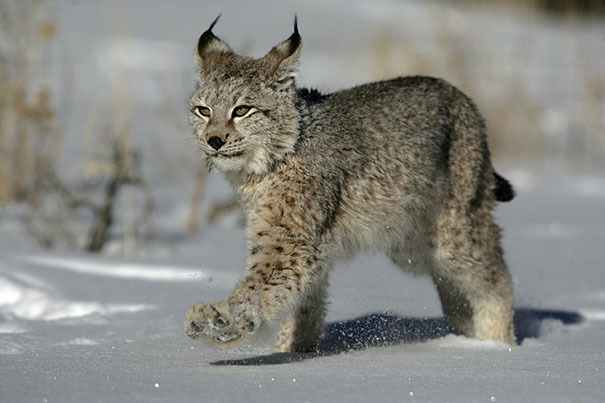 Like most cats, both the sexes mark their territories with feces, urine, or other gland secretions for indicating their presence. The Eurasian lynx has a polygynous mating system meaning the males mate with more than one female per breeding season that starts in January and lasts until April. During this time, the estrous cycle in females lasts for 4-7 days. Once the male comes across its female partner, both the lynxes display courtship by accompanying each other for many days, mating several times a day. 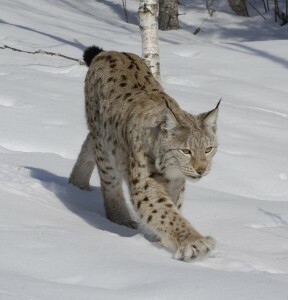 The male lynx looks for another mate when its female partner ends its estrous days. After conceiving, the females build dens in isolated places, usually concealed by roots or branches of trees. 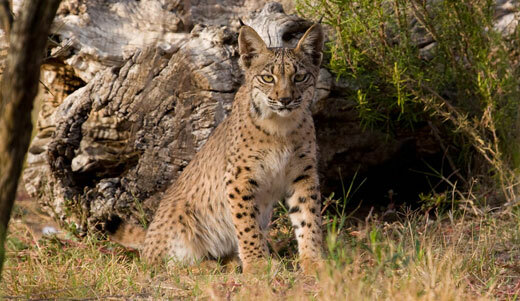 They use dry grass, deer hair, and feathers as bedding materials so that their cubs can lie on them. Once the gestation period is completed, the mother gives birth to a litter of kittens. The young ones, although born blind, open their eyes after 10-12 days. The Eurasian lynx babies originally have grayish-brown hair but achieve the reddish-brown hue at 11 weeks. The kittens are introduced to solid food at about 7 weeks and are completely weaned at 5-6 months. 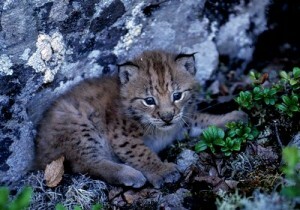 Even though they leave the den 2-3 months after their birth, they remain under their mother’s care for about 10 months. 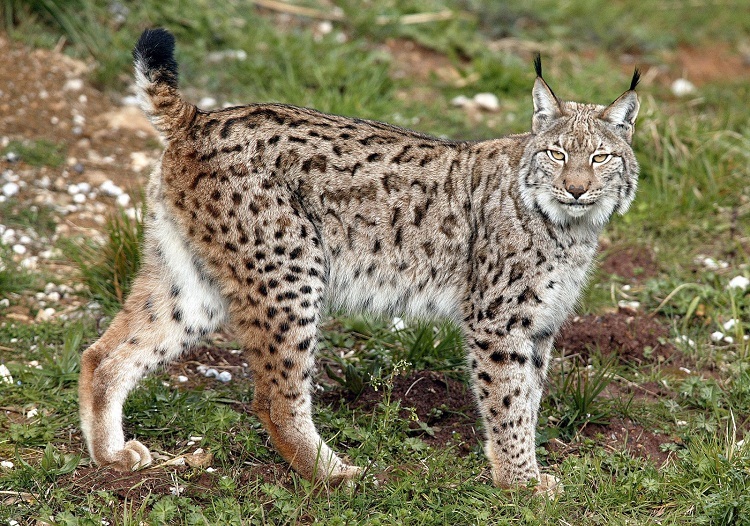 They become sexually matured at around 2-3 years of age. 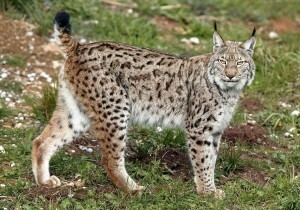 It is the largest lynx species in the world. 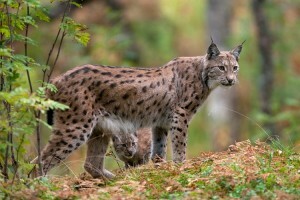 The Eurasian lynx nearly became extinct in Europe, but it has been revived after its successful reintroduction in several countries including Switzerland, Germany, France, Scotland, and Slovenia. They are known to hide any uneaten prey by digging it in the ground so they can return later to consume it. 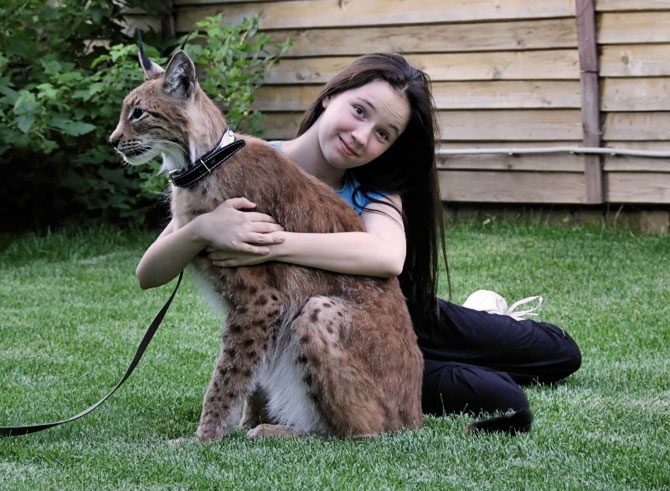 Published on November 16th 2015 by admin under Coniferous Forest Animals.